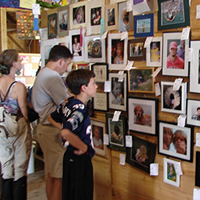 Experience the arts on Martha’s Vineyard in myriad ways. For decades, the Island has served as a destination and retreat for artists and artisans; the result is a lively, thriving art community that spills over into every facet of Island life. Dance, music, theater, film and fine arts each have multiple venues in which to showcase their work. From art galleries to film festivals, community-based workshops to professional theater, literary reading groups to book signings and music both in the streets and on stage, to experience art in Martha’s Vineyard’s intimate venues is a singular experience you won’t want to miss.